The current week's homily is available on a link on the front page of the website next to the link for the current week's bulletin. On the page with the prior bulletins, the corresponding homily will be sitting side by side with its bulletin. We started on the anniversary of the start of the Catholic Church, Pentecost Sunday --- four years ago. This week, the Thirteenth Sunday in Ordinary Time, is our two hundred seventieth!! podcast to be posted. The homily is given by Father James Brady. This weekend brings an end and a beginning. Last week was the last week of my term as administrator at St. Peter's in Grand Prairie, so my work there comes to an end. St. Peter's new pastor, Fr. D. Blaine Clement, begins his service there Monday, July 1. Please keep him and the people of St. Peter's in your prayers for a smooth transition. Also on Monday, July 1, I begin my annual vacation, and will be out of the parish next weekend and the weekend of July 21/22 (I will be here the weekend of July 13/14). During the time of my absence, the parish will be sacramentally ministered by the capable hands of Msgr. Melancon and Fr. Leger. My heartfelt gratitude to them for taking on the extra duties in my absence. Last weekend also marked the third anniversary of me being your pastor. As with any parish, we've had our joys and sorrows over the last three years, as well as our successes and bumps in the road. I want to thank all of you for making my job as pastor a joy. St. Landry has been a great blessing to me, and it is because of you. Your patience and support is very much appreciated, and you all have made me a better person and priest. Our parish has changed over this time, and my hope is that St. Landry as a community will continue to adapt to meet all your spiritual needs. Thanks again! The bulletin for the week of June 30, 2013 has been posted. Click here to see it. The current week's homily is available on a link on the front page of the website next to the link for the current week's bulletin. On the page with the prior bulletins, the corresponding homily will be sitting side by side with its bulletin. We started on the anniversary of the start of the Catholic Church, Pentecost Sunday --- four years ago. This week, the Twelfth Sunday in Ordinary Time, is our two hundred sixty ninth!! podcast to be posted. The homily is given by Monsignor Louis Melancon. Once again this year, the Fortnight for Freedom program will be held in Opelousas at Our Lady Queen of Angels’ parish hall. Fortnight for Freedom is a two week daily group prayer for our country leading up to the celebration of it's founding on July 4. The program began last year in response to regulations in the health care act that require health insurance policies to provide coverage for “health care” that our Church teaches are morally wrong and in some cases a violation of human rights. These “health care services” include abortion, sterilization and the provision of contraceptives. An explanation of the program and the prayers are provided in the bulletin insert contained herein. All evenings will be at 6:00 p.m.
… except Sunday (June 23) and Sunday (June 30) will be at 7:00 p.m.
As we have discussed in our homilies over the past months here at St. Landry, the health care act is further evidence of the separation of our country’s secular morality from our Christian morality. This separation has been occurring gradually for quite some time, but especially in the last 50 years. We should all remain vigilant in living our lives according to Christian values, those taught to us by God the Father Himself in the life of His Son, Jesus. Jesus’ teaching remain the same; it is our society that is changing, and in some cases, not for the better. Parents should be vigilant in making sure their children are taught these Christian values, which is more difficult to do when societal morality is inconsistent with them. The bulletin for the week of June 23, 2013 has been posted. Click here to see it. The current week's homily is available on a link on the front page of the website next to the link for the current week's bulletin. On the page with the prior bulletins, the corresponding homily will be sitting side by side with its bulletin. We started on the anniversary of the start of the Catholic Church, Pentecost Sunday --- four years ago. This week, the Eleventh Sunday in Ordinary Time, is our two hundred sixty eighth!! podcast to be posted. The homily is given by Father James Brady. 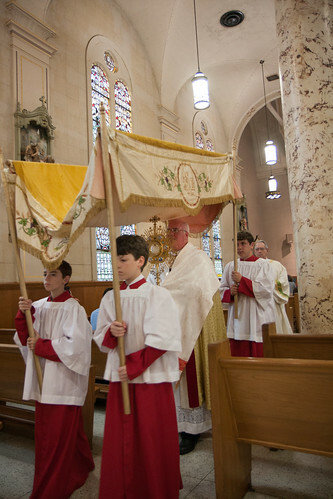 On Corpus Christi Sunday, we had day long adoration at St. Landry Catholic Church followed by benediction. The monstrance used is very ornate and includes what looks to be limoges hand painted porcelain pictures of the four gospel writers along with St. Peter and St. Paul. The monstrance draws its name from the Latin word "monstrare" which means "to show". First, here is a link to a 3D Photosynth of the monstrance. Clicking at various points on the monstrance will zoom in, bring in more detail, or zoom out. Click here for the 3D monstrance. There are details of the monstrance within the photo gallery. 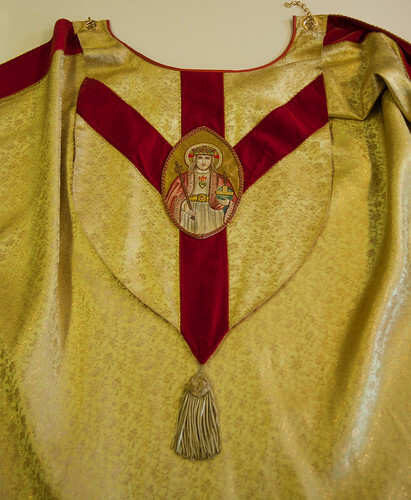 And there also details of the cope worn by Father Brady during the procession. Click here for the photo gallery. Come out and join us on Tuesday - 6:30 PM! For some years, Keith Hebert has organized a monthly Men's Mass for guys in the Opelousas area. This mass has moved from place to place, home to home, business to business. The hope is that by bringing the mass out to men everywhere, there is an opportunity to bring men both closer to God and to bring men back into the Church. On Tuesday, June 18, 2013, that monthly Men's Mass will be hosted at Our Lady of the Oaks Retreat House, 214 Church St., Grand Coteau, Louisiana . Jimmy Dauzat, the director at the retreat house, has been gracious enough to host this month's event. Following the mass, a meal of red beans and rice will also be served ... a long time favorite of folks who have attended the retreat. The mass will be celebrated by our own Monsignor Louis Melancon. Monsignor just recently celebrated 50 years as a priest! When you shake his hand on Tuesday night, just think of how many times those hands have participated in the consecration of the body and blood of Christ over those many years. If you plan to attend, please RSVP to me so we can get a head count. I would also encourage you to invite friends and family who you think might be interested in attending a retreat. This is a wonderful opportunity for your friends and family who are curious about the retreat house to get a chance to visit and look around in a fun atmosphere. Don’t hesitate to call or email me. To see a video about the retreat house: click here. This weekend we celebrate Father's Day. Many thanks for all our devoted fathers who lead and guide their families by teaching and example through the ways of the world to the presence of Christ, and thus to God, The Father. We pray that in their fatherly vocation they may always stay focused on the true good for their families, the salvation of the souls entrusted to their care. Happy Fathers Day! At St. Landry Church, our patron serves as a father to us as a church family. We celebrate the feast of our patron, St. Landry, today (St. Landry's actual feast day is June 10, but we celebrate it today as a full community since he is our patron). He is a wonderful patron for us in both his teaching and example, and as we learn more about him, we can learn more about what our goals should be as a church community. His life has a great similarity to what Pope Francis is calling us to be, and the homily this weekend will focus on St. Landry and how we can respond to his example individually and as a church community. Please note that in the bulletin this week is a survey regarding Opelousas Catholic. It is the last sheet of the PDF file. An explanation is provided below. We hope that you are able to take the time to provide the Board of Pastors input on how we can improve the services Opelousas Catholic provides our families. In this bulletin is an insert containing a short survey regarding Opelousas Catholic. Msgr. Keith DeRouen was recently appointed Chancellor of OC and has asked the members of all "owner parishes" to provide feedback regarding our school. For your information, there are five "owner parishes" of OC: Holy Ghost, Immaculate Conception (Washington), Our Lady of Mercy, Queen of Angels and St. Landry. The pastor of each owner parish is a member of the Board of Pastors, which is charged with leading and guiding OC. The Chancellor is appointed by the Bishop to be the head of the Board of Pastors and the primary contact of school personnel with the Board. After being appointed Chancellor, Msgr. DeRouen asked for input regarding the administration of OC so that the Board of Pastors can effectively address any needs at OC. We ask that you use the survey inserted in this bulletin for this purpose. The survey is not limited to families who send their children to OC. All parishioners are invited to respond, including current OC families, alumni, and families with children who chose other ways to educate their children. In short, we seek input from our entire community. The survey is short and should not take too much time to answer. Msgr. DeRouen asked that all surveys be signed. Be assured that confidentiality will be maintained, as only the pastor of each parish will know the identity of the respondent. For tabulation and discussion by the Board of Pastors, the names of the respondents will be removed. Next weekend, there will be a basket in the back of the church for responses, or if you prefer they can be dropped off at the parish office during business hours. We ask that responses be received by Monday, June 24. Thank you in advance for your participation. We hope this survey will help the Board of Pastors in continuing to make OC a place where our children can be educated and formed in our Catholic Faith while developing to the fullest potential the natural intellectual and physical abilities God has given them. The bulletin for the week of June 16, 2013 has been posted. Click here to see it. 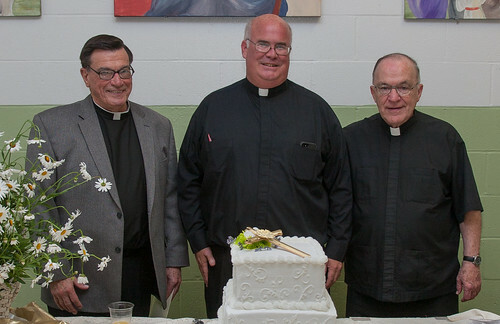 May 25th was the 50th anniversary of the ordination to the priesthood of our own Monsignor Louis Melancon as well as Monsignor Paul Metrejean. There was a wonderful reception held at the Opelousas Catholic cafeteria after the 10 AM Sunday mass. Monsignor began his priestly ministry here at St. Landry in 1963, serving as a teacher at AIC, and now is in residence here. He has spent, altogether, some 23 years of his priestly ministry serving the Opelousas area, including stays not only here at St. Landry, but also at St. Peter in Grand Prairie and at Our Lady Queen of Angels in Opelousas. Monsignor has been a great gift to our community, and he continues to be a vital part of it in his continued service, especially to our children at Opelousas Catholic. 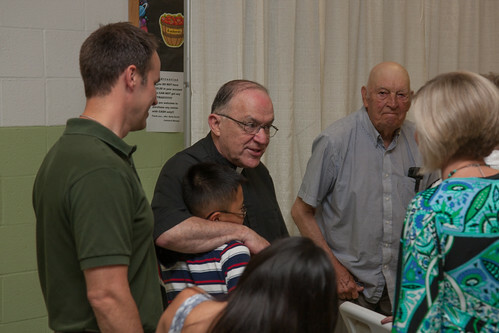 Words cannot adequately express the value of Monsignor's presence to our community or the gratitude that we have. However, knowing Monsignor, a simple "thank you" more than suffices. So let us all "thank" him and celebrate God's gift to us by his presence in, and his service to, our community. The current week's homily is available on a link on the front page of the website next to the link for the current week's bulletin. On the page with the prior bulletins, the corresponding homily will be sitting side by side with its bulletin. We started on the anniversary of the start of the Catholic Church, Pentecost Sunday --- four years ago. This week, the Tenth Sunday in Ordinary Time, is our two hundred sixty seventh!! podcast to be posted. The homily is given by Monsignor Louis Melancon. 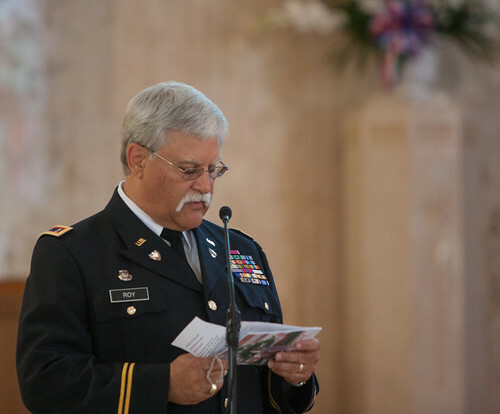 St. Landry Catholic Daughters Court 119 sponsored a Patriotic Rosary on Monday, May 27 inside St. Landry Catholic Church. 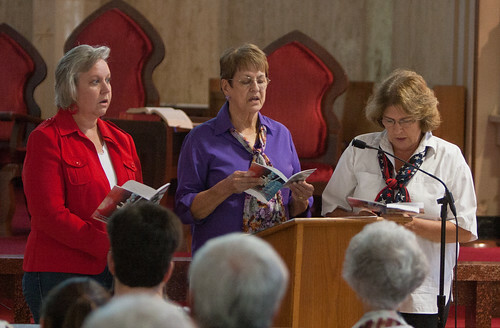 The rosary was led by veterans and members of the Catholic Daughters. Almighty God, send your blessing upon all who serve in our armed forces. Shield them from all harm. Let peace be the sentry that stands guard over them. ease their sufferings and heal their wounds. Put an end to wars over all the earth, and hasten peace. Grant this through our Lord Jesus Christ, the Prince of Peace, now and forever. Last weekend, we welcomed seminarian Blake Dubroc at all our Sunday Masses. Blake is originally from Marksville and just finished his junior year of philosophy at St. Joseph's Seminary College at St. Benedict, Louisiana. He will be with us until July 15. We certainly appreciate him being here, and we hope he has a pleasant stay while living here at St. Landry. Below is a short biography for Blake. In our Corpus Christi celebration last Sunday, we included a Eucharistic procession and adoration after the 10am Mass until the 5pm Mass. Adoration was well attended throughout the afternoon. Adoration provides an opportunity for quiet prayer in the presence of God. Although it is important that we bring our needs to God and give Him thanks for the blessings He has given to us, it is even more important that we make the time in our prayer to listen to God in the promptings of the Holy Spirit. This is best done in quiet reflection, especially in the presence of the Blessed Sacrament. 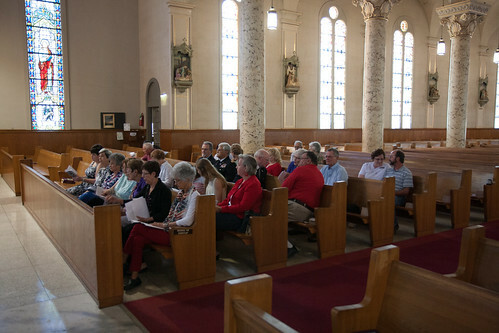 In Opelousas, we have many opportunities for reflection and prayer before the Blessed Sacrament. Besides the times when the big church is open, here at St. Landry the Valentin Hall chapel is open during business hours during the week, and we have 24 hour adoration every First Friday beginning at 7am and continuing until the 8am Mass Saturday morning. Queen of Angel's adoration chapel is open perpetually, so it is always available for prayer. Our Lady of Mercy also has a visitation chapel (code is needed, just call the office) which is always available. We are blessed in our community to have so many opportunities for quiet prayer with Our Lord. Families that pray together, especially those with children, experience a greater peace and unity that only God can give, especially when we remove the distractions of our daily lives for just a short period of time. Let us all make a renewed effort to increase our prayer so as to better serve God and our community! It is a great privilege to serve you this summer as your parish seminarian. My name is Blake Steven Dubroc, and I am originally from Marksville, Louisiana. I am a graduate of the 2002 Class at Marksville High. I then moved out to Baton Rouge in 2002 to pursue my Bachelors of Arts in Political Science at Louisiana State University, graduating in 2006. In January 2008, I decided to move to Lafayette, Louisiana to begin a new career. For four years, I operated my own independent insurance agency, BSD Solutions, LLC. When I initially came out to the Lafayette area, I had no idea I was in the beginning stages of an “internal conversion” back to the Catholic faith, and as I progressed in my discernment, I began to open myself up to the possibility that God may be calling me to the priesthood. With the vocational call everpresent in my mind, I decided to apply to St. Joseph Abbey Seminary College in Covington, Louisiana. In January 2012, I entered the Seminary Priestly Formation. This fall I will be entering my final year of Philosophy studies. So God-willing, I will be able to serve in the near future as an ordained minister. Please keep me in your prayers as I continue in formation and be assured of my continued prayers for you. God bless you! The bulletin for the week of June 09, 2013 has been posted. Click here to see it. The current week's homily is available on a link on the front page of the website next to the link for the current week's bulletin. On the page with the prior bulletins, the corresponding homily will be sitting side by side with its bulletin. We started on the anniversary of the start of the Catholic Church, Pentecost Sunday --- four years ago. This week, Corpus Christi Sunday, is our two hundred sixty sixth!! podcast to be posted. The homily is given by Father James Brady.